He didn’t think he had played particularly well, but he had scored the opening goal at a very opportune moment, in the 45th minute. It was a superbly hit strike from outside the box, revealing the kind of technique that could make him a top player. But Jordan Flores was right: he did not have a good game against Blackpool on Tuesday evening. His goal and a beautifully weighted pass to release Will Grigg were the highlights, but his passing was too often errant and it was clear that he still needs to work on his defensive skills. But for those who have closely followed Flores’ career the biggest plus of the night was that he played the full 90 minutes plus of the match. 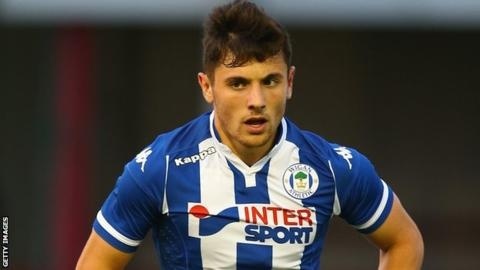 It was the first time he had done so in a competitive match for Wigan after having made his debut at Brentford in the final game of the 2014-15 season. Jordan Flores is 21 years old, a local lad from Aspull. He played with the Latics juniors, later to re-join the club as a 15-year-old. He was to work his way up through the youth team and the development squad to make that first team debut in May 2015. The club had once prided itself on developing home-grown talent, but had somehow lost its way in recent years. Flores had come on to the field at Brentford to replace Tim Chow, another local lad who had come up through the ranks. Together they represented “homegrown youth” when Latics had for too long preferred to bring in young loan players from other clubs. Flores is without doubt a talented player. He has the kind of technique that would enable him to feel at home among the talent at La Masia. He is blessed with a sweet left foot, excellent close control and a powerful shot. His best position is probably on the left side of a midfield trio, the kind of role that Chris McCann would often play in the era of Uwe Rosler. Flores is left sided, but not a winger. But in Paul Cook’s preferred 4-2-3-1 system where could Flores fit? It is not unusual for young footballers with genuine talent to be lacking in the physical side of the game. Flores has clearly been working on his stamina and having to sometimes play at full back or wing back will surely have helped him appreciate more the defensive part of the game. The challenge ahead is for him to be able to display his fine skills, but at the same time complement them with the physical attributes necessary for a successful footballer in the modern era. When Warren Joyce sent him on loan to Blackpool in January it was by no means certain that Flores would be coming back this season. He was in the final 6 months of his contract with his future at the club seemingly in the balance. However, although he was not able to establish himself as a regular starter he went on to make 14 starts, with 7 appearances off the bench, scoring 3 goals. His total of 1,300 minutes playing time with the seaside club was to dwarf the combined total of 194 minutes he had previously spent on the pitch for Latics. The manager has already let us know that his squad is currently too big and that more players will be leaving. Is he hinting that Flores will be sent off on loan again? The decision Cook will need to make before the end of August is whether Flores is ready to make an impact in his 4-2-3-1 system, and if he is, in what position? But another loan spell is a distinct possibility. Jordan Flores remains a bright young talent with his best years ahead of him. With the right amount of nurturing he could become a very fine player.